Accused of cheating after taking a make-up exam? Attorney defense tips. Students miss exams or paper deadlines for many reasons: illness, family emergencies, and other unexpected issues can arise. Most professors are understanding and will work with a student if they keep them informed. 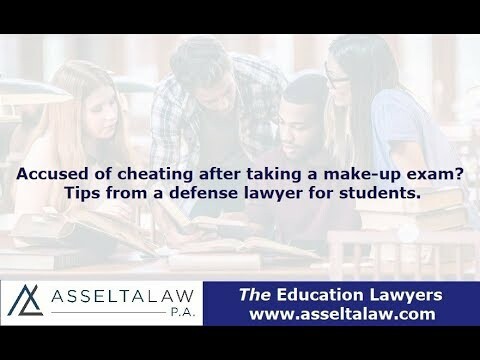 However, what can happen if after you get an extension for a paper or take a make-up exam and are then accused of cheating? Read on for tips from a defense attorney for students. How do I prove I am not making up an excuse for being absent? If you believe the professor does not have any other evidence to support the cheating accusation, bring a note from a doctor with you. If you were sick and stopped by the health clinic then this could be one way of proving your innocence. If it was a family issue - plane tickets or other travel receipts could back up your situation. I was charged with gaining an academic advantage, can you help me fight the academic integrity charge? Yes. I help students all over the country defend against academic integrity and honor code violations. I assist students using my nearly twenty years as an attorney combined with a specialized knowledge of the university disciplinary process to help students achieve positive results.